Mahatma Gandhi National Rural Employment Guarantee programme is being refurbished as MGNREGA 2.0. Within two months, the country will have a rural employment programme that will pay people for the work they usually do for sustenance. The programme’s proposed list of permissible works is robust with 30 new works. From the hills to the plains, deserts to flood-prone areas, and from uplands to coastal areas, rural residents will get paid for development works like deepening ponds, creating shelter for livestock, or clearing a silted spring in the hills. All this on one condition: people have to demand job under the programme. The new listed works are related to upgrading regions’ ecology critical to people’s livelihood like farming, fishery and livestock rearing. The makeover was essential for two reasons. First, the demand for employment has not increased much under the current programme. Thirty new works will involve a large number of people, and trigger demand. Second, the current list does not reflect the diversity of India’s geography. The new list will cover all the agro- ecological zones. Does this mean MGNREGA 2.0 is the country’s first ecological services payment scheme for farmers? It may be the inadvertent fallout. At present, ecological services payment schemes cover carbon sequestration and storage, watershed development and protection, non-domestic biodiversity protection and forest protection. Uttarakhand and Himachal Pradesh have been demanding environmental services payment for protecting forests that ensure water discharge to the plains. In the climate change regime, carbon emission reduction and other mitigation activities make huge businesses. But agriculture and farmers have been kept out of the formal carbon market that is worth more than US $100 billion. Farmers, particularly those practicing traditional farming, have been rarely considered eligible for payment for their ecological services. Now, it is being felt that farmers should be rewarded for their ecological services. Traditional farming is considered climate resistant and less harmful to the environment. Under the climate change mitigation and adaptation plans, agro-biodiversity is mentioned as a potential instrument to be explored. Poorest farmers living in degraded environment usually practise this type of farming. When agriculture with low ecological footprints is encouraged for payment for ecological services, it would serve two purposes—bring down poverty and make agriculture climate resistant. A Kerala Agriculture University research on Muthuran tribe’s traditional ragi (finger millet) farming found it contributed greatly to protection of biodiversity and made local sources of earning climate resistant. If the tribe is paid for this ecological service, the government will annually give Rs 1,668 for each variety of finger millet per hectare. But there are challenges facing MGNREGA 2.0 too. How will the programme be implemented? There are not many precedents, particularly those that link current carbon market or ecological services payment to traditional agriculture. Where will we implement it? In India rainfed farming qualifies for it. But for a formal payment system, specific locations duely certified are required. Also, who and how will we monitor whether farmers are sticking to the incentivised services? More importantly, how will farmers be paid for their ecological services? Cash payment is not an option. For, the government is already struggling with this option in other programmes. It can be assumed that the poorest farmers, including livestock rearers and fisherfolk, will subscribe to MGNREGA 2.0 to improve their own living. So the challenge of identification of beneficiary is nullified. By default, traditional farmers will come under this programme. Experiences of the past five years point this out. MGNREGA 2.0 has not been officially called an ecological services payment programme, so monitoring of incentivised services is not required. 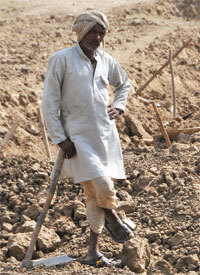 The government will open up works only after the village council approves the work plan, mandatory under MGNREGA. The rural job programme tackles the most contentious question of how to pay for the ecological services in a unique way. One way it incentivises the ecological services of the poor is by paying wage as well as creating productive assets. But the past five years have not been very encouraging in terms of productive assets creation and management under the programme. So, we are back to the old question: how can we realise the potential of the job programme? In our work with marginal farmers in a rain-fed area of Chittoor we have been debating strongly on just this issue for over a year. Can the soil moisture conservation works carried out under MGNREGS be reinforced with programmes to promote traditional dryland agriculture? Watershed development programmes and water harvesting works done through MGNREGS are aimed at improvements in groundwater recharge. The resultant increase in groundwater resources leads to greater use of water and therefore accelerates groundwater depletion. The watershed improvement programmes (be it IWMP or any other watershed programme) are very rarely linked to schemes that create an enabling environment that will conserve the recharged resource. These programmes can so easily be linked to conservation of local, drought resistant crops, fruits, vegetables etc. Whatever be the name - be it PES or any other - without an integrated vision no development programme can be effective.